IT’S part of popular football culture that Bayern Munich have always been the dominant force in German football. Certainly, Bayern is the country’s most high-profile club and undoubtedly the most successful football institution from the Bundesliga. In recent years, only Borussia Dortmund have challenged Bayern on a sustainable basis, but the first club to grapple with the slick Bavarians was a team from North-Rhine Westphalia, a club from a small city of 250,000 people. Borussia Mönchengladbach were not only a fine football team, they also represented the alternative to the Bayern machine, which was so indelibly aligned to the West German national team. The explanation that has often been used to summarise the creative tension between Bayern and Gladbach has been “radicalism versus rationality” or “establishment versus rebels”. Furthermore, it has been suggested that it was a clash of playing styles – Bayern’s technical professionalism built on possession football against Gladbach’s free-for-all ethos that relied on swift counter-attacks. Bayern were, apparently, masters of the 1-0 win, while Gladbach would go all-out in search of goals. The statistics do not support this argument. In the period 1968-69 to 1976-77, Bayern scored more goals than Gladbach in six of the nine seasons. Moreover, they conceded more goals than their rivals in six campaigns. Any accusation that Bayern were safety-first seems to hold little water. More likely, Gladbach offered an antidote to Bayern’s insatiable appetite for headlines and drama. 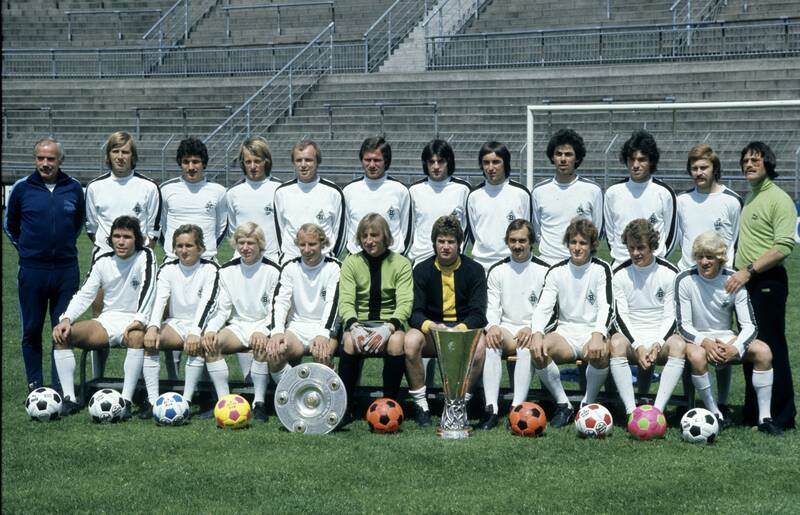 Borussia Mönchengladbach 1975 mit Meisterschale und UEFA-Cup, hi.v.li. : Trainer Hennes Weisweiler, Henning Jensen, Walter Posner, Lorenz Günther Köstner, Hans Jürgen Wittkamp, Jupp Heynckes, Christian Kulik, Dietmar Danner, Hans Klinkhammer, Frank Schäffer, Horst Köppel, vorn: Ulrich Surau, Allan Simonsen, Calle del Haye, Berti Vogts, Torwart Wolfgan Kleff, Torwart Gregor Quasten, Uli Stielike, Rainer Bonhof, Herbert -Hacki- Wimmer, Roger Roebben – HM Borussia Moenchengladbach 1975 with Bowl champions and UEFA Cup Hi v left team manager Hennes Weisweiler Henning Jensen Walter Posner Lorenz Günther Goswami Hans Jürgen Wittkamp Jupp Heynckes Christian Kulik Dietmar Danner Hans Klinkhammer Frank Schäffer Horst Köppel front Ulrich Surau Allan Simonsen Calle DEL Haye Berti Vogts Goalkeeper Kleff Goalkeeper Gregor Tassels Uli Stielike Rainer Bonhof Herbert Hacki Wimmer Roger Roebben HM. As a number of chroniclers of German football have said, Bayern were no more “establishment” than the team from the city that gave the world Josef Goebbels. For part of the 1970s, Bayern versus Gladbach included the sideshow Guenther Netzer versus Franz Beckenbauer. Netzer was a long-haired free spirit and a discotheque owner, but he was also a committed businessman, not unlike Beckenbauer. Bayern’s captain, short-haired, clean-shaven and upright, always appeared very much part of the system, slightly aloof but eminently respectable and always listened to. At the same time, Bayern had a figure every bit as outspoken and noticeable as Netzer in Paul Breitner, described by Brian Glanville as a paradox, “a rich Bavarian Maoist”. Gladbach, conversely, had Berti Vogts in their team, a player who looked more like a buttoned-up bank clerk than 1970s icons Netzer and Breitner. In truth, both clubs had conventional and unorthodox individuals. Both teams had won promotion to the Bundesliga in 1965, Bayern topping the southern regional league and Gladbach winning in the west. They both had young teams and this, to some extent, was the root of their rivalry. It was also how Gladbach acquired a new nickname – the youthfulness of their squad led them to be tagged, Die Fohlen – the foals. While Bayern won their first title in 1968-69, Gladbach secured the next two, the first team to retain their crown since the Bundesliga was formed. Netzer was now in prime form and his performances for the national team – notably in the European Championship of 1972 – brought him to the attention of the rest of Europe. Gladbach lost their title in 1972, needless to say to Bayern, but Netzer was named player of the year. In 1973, with Real Madrid already agreeing to sign Gladbach’s star man, he came off the bench in the DFB Pokal final to score a dramatic winner as his team beat 1.FC Köln. Again, he was Germany’s top player as he moved to Madrid. Gladbach’s coach, Hennes Weisweiler, had guided them from the regional leagues to the top of German football, but with some people expecting the bubble to burst, the 1974-75 season saw them reach a new high before their long-time manager also departed. Weisweiler adopted a fast and furious adaption of the Dutch Total Football with an exciting front three that included the Danish duo of Allan Simonsen and Henning Jensen, and the prolific Jupp Heynckes. Gladbach soon got over the loss of Netzer as Rainer Bonhof cemented his place in the team and became renowned as a free-kick specialist. Weisweiler’s team won the title by six points, beating off the challenge of Hertha Berlin. Bayern, who had won their first European Cup in 1974, had slumped to 10th. Gladbach also lifted the UEFA Cup, beating 1.FC Köln in the semi-final before trouncing FC Twente 5-1 on aggregate in the final. The cognoscenti were talking in glowing terms of Die Fohlen as the new successors to a now Cruyff-less Ajax Amsterdam. Weisweiler moved to Barcelona and in his place came Udo Lattek, a coach who had won two European Cups with Bayern Munich. In 1975-76, a more cautious Gladbach – they scored 20 fewer goals in Lattek’s first season – retained the Bundesliga title ahead of Hamburg and Bayern. The problem for Gladbach was that Bayern had just notched up a third successive European Cup, achieved in a very uninspiring and machine-like manner against a popular and flamboyant St.Etienne team. In 1976-77, Gladbach had the chance to put that right. In the Bundesliga, the title was clinched on the final day with a 2-2 draw with Bayern after Heynckes and Uli Stielike has given them a 2-0 lead. But it had been tight – Schalke and Braunschweig both finished one point behind and Frankfurt were only two adrift. Lattek’s experience in Europe paid off for Gladbach as they reached their first European Cup final, facing Liverpool in Rome. Although Lattek’s side had been crowned German champions just four days earlier, they had struggled to score goals in 1976-77, netting only 58 in 34 league games. Heynckes, their top marksman, was not 100% fit and there was a mood of realism in the Gladbach camp. “It will be hard for us, but it will not be impossible for us to win,” said Lattek, aware of the rising power of Liverpool. With Gladbach appearing nervous and lacking confidence, Liverpool went ahead, but Simonson equalised early in the second half. At times, Gladbach looked as though they would go on to win, driven by the excellent Bonhof, but Liverpool scored two more goals, in the 64th and 82nd minutes to win 3-1. And with that ended the Gladbach era. In 1977-78, they finished runners-up in the Bundesliga on goal difference to 1.FC Köln and year later, they were wallowing in mid-table. Lattek left in 1979 after a second UEFA Cup was won by the club and was berated for having allowed a fine teamto become stake without succession plans – a criticism that was aimed at him from his time with Bayern Munich. Gladbach have never had it so good. Their golden age belonged to a different time, an era when success could be achieved by smaller, perhaps less fashionable clubs. With five Bundesliga titles and four European finals, providing a host of players that would form the backbone of the West German team that won the 1972 Euros and 1974 FIFA World Cup, Borrusia Mönchengladbach were one of the European teams of the decade. When Berti Vogts finished his career in 1979 after the win of the UEFA Cup he apparently said: “This will be the last title for Borussia for a very long time”. How right he was, although it was quite predictable considering that a lot of core players such a Berti Vogts, Rainer Bonhof or Jupp Heynkes finished their careers. Given limited financial resources Borussia had not the means to adequately replace such fine players. So, the next and only title since then is the win of the DFB Pokal in 1995. Great article. Thanks Neil for a walk down memory lane. Just a little mistake: Hennes Weisweiler never coached at Real Madrid. He went to Barcelona to be the replacement of Rinus Michels. Thanks – will change that. Andre forgets that Gladbach in the early 80’s had Mattheus, Rahn, Mill, Bruns, Criens and Linen among other young foals. This team coached by Heynckes challenged for the bundesliga title, ending in third multiple times. I personally believe their era ended with the 1984 Pokal final.